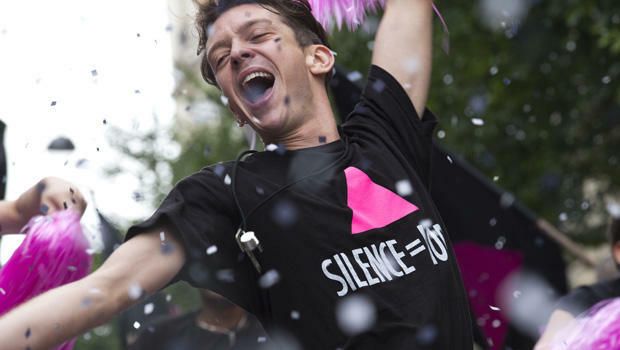 Set during the early 1990s, the new French film "BPM (Beats Per Minute)" (which had its U.S. premiere this weekend at the New York Film Festival) uses a predominantly documentary style to depict a new model of in-your-face activism that purposefully thrust the suffering of gays, drug addicts, prostitutes, hemophiliacs and others affected during the early years of the AIDS crisis into the public spotlight. France was not alone in ignoring those members of the population who were sick with the disease or at risk of acquiring it, nor in projecting an attitude of homophobia. The desperation of those who were HIV-positive, and who faced little or no help for their illness, only fueled their defiance, resulting in protests aimed at the greatest possible TV and media exposure. Inspired by the American group Act Up, Act Up Paris was formed in 1989 to engage with the public, shame government officials, and call pharmaceutical companies to task for what was deemed to be a cruel withholding of scientific information and potentially life-saving medication. Director and co-screenwriter Robin Campillo (who previously directed "Eastern Boys," and co-wrote the 2008 Oscar nominee "The Class" and the TV series "The Returned") was a member of Act Up Paris, and while his film is not a literal history of the group, "BPM" captures the passion of the group's members, a kaleidoscope of citizens who vehemently argue about political stands and media engagement. Scenes of group meetings in which proposed actions are debated, or past actions dissected for success or failure, are stirring, and instructive in how to effectively deploy democratic activism, especially in cases where ideological splits threaten to scuttle any progress at all. Among the group's members (most of whom are HIV/AIDS-positive, or "poz," gay men) are Sean (Nahuel Pérez Biscayart), an outspoken advocate for bringing the battle to the front steps of a complacent pharmaceutical industry; Thibault (Antoine Reinartz), a group leader more interested in diplomatic engagement; and Sophie (Adèle Haenel), an organizer who leads protests that inevitably end with arrests. In one instance, the more militant members lay siege to the corporate offices of a drug company, hurling balloons filled with fake blood. Cameras are not far away. And when corporate officers are invited to an Act Up meeting to answer questions about drug trials, the hall devolves into accusations and insults. The group's disparate members cohere into not quite a like-minded community mimicking a dysfunctional family, which for some may be the only real family they have. That intimacy forges relationships that may be driven as much by politics as by passion, as in the case of Nathan (Arnaud Valois), a young gay man who is attracted to Sean despite his being HIV positive. With assured direction, nimble editing and evocative, artistic photographic touches, Campillo's film (which won the Grand Jury Prize at this year's Cannes Film Festival) is a vital document of an activist's passion, a disease's cruelty, and an indomitable desire for action and acceptance, even in the midst of denial or complacency. "BPM (Beats Per Minute)" (distributed by The Orchard) screens at the New York Film Festival on Monday, before opening in select theatres October 20. In French. 144 mins. The film is not rated, but includes sexual situations. To watch a trailer for "BPM" click on the video player below.